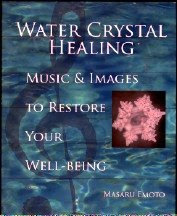 I've just started working with a very interesting book, Water Crystal Healing, by Masaru Emoto, the best-selling author of Messages from Water. His work was featured in the film, The Secret. Dr. Emoto has what seems to me to be a whole new take on the subject of sound for healing: viewing a crystal formed by the energy of a musical piece while listening to that particular piece of music. He says "when you listen to a piece of music and look at the water crystal created by the vibration of that music simultaneously, you can 'see' the vibrational pattern of the music in the crystal and absorb all the vibrations into your body through your eyes and ears." In case you are not familiar with Dr. Emoto's work, his lab developed a way to photograph individual water crystals. They found that the emotional atmosphere around the crystals affects their shape. Even taping printed phrases to the outside of a water container would affect the shape of the crystals that formed in the container. The results were not caused by the experimenters. Similar crystals were caused by similar sentiments even when the phrases were in foreign languages and the technicians did not know what they meant. Unpleasant words made for ugly, blob-like crystals. Phrases expressing sentiments like love, gratitude, and other benevolent emotions caused intricate and beautiful crystals. What does that have to do with using sound for healing, you may ask? Well, the premise of this book, which comes with two music CDs, is that when certain pieces of music are played in the presence of pure water, the water forms exquisite crystals with a certain energy vibration, or (in Japanese) hado. Gazing at a photo of particular crystal while at the same time listening to the piece of music that caused it to form will supposedly convey to you the healing benefits of that particular piece of music. This is all very interesting, you may say, but how did they measure the effects of the music? All I can tell you is what Dr. Emoto wrote. He says that he measures the energy vibration, or hado, of the water crystal photograph by placing it on a hado-measuring device called a Magnetic Resonance Analyzer (MRA). Dr. Emoto says he has been using the MRA for years to analyze people's hado and treat water for them to drink to adjust their energy so that they are healthy. He says it works. He says "Organs and diseases have measurable hado, a subtle form of energy that is easily transmittable and present in all things. In English, hado translates as 'wave' or 'vibration'." Because he had discovered that he could analyze photos of absent patients with equally good results, he figured out that he could measure the hado of music by playing it in the presence of vials of water (50 samples for each piece of music) and measure the hado of the resulting water crystals. So if this seems like somewhat circular logic to you, well, it does so to me, too. I have admired Dr. Emoto's work in the past. I've read a couple of his books and watched his video. But this seems a little far-fetched to me. The music on the CDs is all European classical music of the late 19th and early 20th centuries. To each musical selection are attributed emotional hado and physical hado. For example, the first selection is The Moldau, by Bedrich Smetana. It is said to convey emotional hado of calmness, peace of mind, and relief from irritability as well as physical hado of improved lymphatic flow. The crystal is especially intricate and lovely. My favorite crystal is the one that represents Debussy's Prelude to the Afternoon of a Faun. The emotional hado is said to cleans the heart and body and relieve emotional stress. Physically it is said to affect the lumbar vertebrae and improve lower back pain. I would love to know what Jonathan Goldman would say about this one. And I would love to know what you have to say about this book and CD set after you have worked with it. Anyway, the musical selections are lovely, and I love the photos. Just when you think there is nothing new in a field, here comes something like this. Whether it works as advertised or not, it is fun to experiment with, and I feel blessed to have found it. I'll let you know how my experiments turn out. Please leave a comment to tell the rest of us know about yours, OK?